. . . Can a woman of 55 find happiness with a man twice her age? . . . 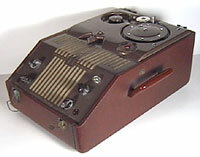 When contributor T. Storm Hunter purchased a used Webster Chicago Wire Recorder years ago, it included a spool of recording wire. Stormy was delighted to discover that the wire contained a recorded program featuring Jim Hawthorne on KNX radio in Los Angeles. On the wire spool, someone had written "November 8, 1951". Jim Hawthorne passed away November 6, 2007. He was 89 years of age, just 2 weeks short of his 90th birthday. 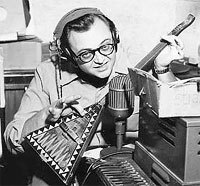 Some referred to Hawthorne as the first "free form" disc jockey, beginning his career at KXLA Los Angeles at the beginning of personality music radio in the late 1940's. His concurrent work in television, however, made him an early multimedia star and a truly unique broadcaster. In the early 1950's, he created the first late evening talk show on TV, This Is Hawthorne, considered by some to be the predecessor of Saturday Night Live. He also created, produced and starred in a Saturday night coast-to-coast radio program, The Hawthorne Thing. It was the last radio network show orginated from NBC's Hollywood Radio City. Hawthorne was also actively involved in First Generation Top 40, producing features for KYA (San Francisco) and KDAY, Los Angeles. In the early 1960's, Jim Hawthorne joined KFWB/Los Angeles in mornings and as Assistant PD. He eventually was promoted to Vice President and National Program Manager for Crowell-Collier Broadcasting. He worked at KHJ from 1962-1963. 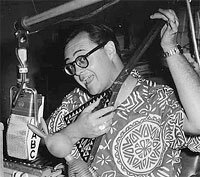 He produced children's programming in Hawaii and was Creative Consultant for Aku on KGMB. In 1970, he moved back to his home town of Denver, Colorado, where he became GM at KOA. He moved back to Los Angeles in 1980. This KNX program features some of the greatest voice and comedy talent of the era. Hawthorne's first guest is Stan Freberg. Hawthorne and Freberg perform a live parody of Freberg's controversial John and Marcia single, called George and Cynthia. Arthur Q. Bryan is introduced as the voice of Elmer Fudd, and Dixie Doogan cartoonist Renny McEvoy joins Hawthorne for a musical performance. Hawthorne also reads a letter from Bill Ballance in Denver, and offers a gag with McEvoy where he encourages the live studio audience to "call it out - he can play anything!" The program is sponsored by The Los Angeles Brewing Company, makers of East Side beer. Every time it's time for a commercial, Hawthorne creates a surprise introduction. There is very little documentation regarding this show and Hawthorne's time at KNX. 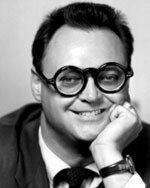 Hawthorne was selected to replace Steve Allen on his Saturday Midnight show when Allen was called to New York to host The Tonight Show. The exact date of this broadcast has now been determined. There's a reference to Wabbits and a recent Easter. Google Books Billboard ® archive of April 14, 1951 includes a short promotional item about Frank Devol's new record, Theme for John and Marcia, which Hawthorne refers to on this show as a "new record". Although the wire recording was labeled November 8, 1951, it's likely this show was broadcast earlier in the year, in the Spring of 1951. Our dedicated REELRADIO research team has decided on Saturday, April 7, 1951. (see COMMENTS). For a program of this vintage, the fidelity is surprising, better than many of the cassette recordings made twenty years later. 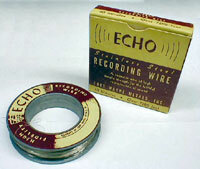 Of course, it's likely the wire was an original recording, not a copy, and there weren't any alignment issues. Some portions of the recording were lost and it may never have included the entire show. A few minutes from both the beginning and end were missing, and a small portion was lost when the original machine owner recorded a birthday message. ©2007 - 2011 REELRADIO, Inc.